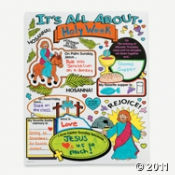 These are "Color Your Own" Holy Week posters and they are fun for kids to fill in. Teach a little bit about Holy Week and have fun with the kids...what could be a better theme for a pre-Easter party or craft project? Easter Crafts and Easter Cake Ideas!